"This does explain why Chekov looked so nervous all the time". The best reaction I’ve seen to the news that actor George Takei, a.k.a. U.S.S. Enterprize’s helmsman Mr. Sulu, is gay. I know I was supposed to do the “Top Ten Favorite Albums” thing over a month ago. Well, you know the story. Been busy! I was going to do all ten in one sitting but that is not going to happen either. Busy. So it’s going to be one album at a time. Maybe it’s better off this way so you can absorb the work of each artist. Here we go. The 10’th album on my all-time favorite list has only recently come across my ears, but maybe the oldest record on my list. The cover is appropriate for a Halloween post I reckon. And YES, that is what they wore onstage. 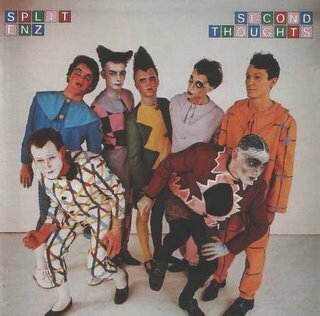 “Second Thoughts” by the New Zealand band Split Enz was released in 1975. For those who are not privy to my musical tastes, I am a HUGE fan of the Finn brothers, Neil and Tim, and Enz brought them world wide recognition when the Neil penned tuned “I Got You” broke the US top forty in 1980 (more info on the band here). Tim invited younger brother Neil to joined the band while touring to support this album. “Second Thoughts” is a “do-over” sort of an album, as many of the songs were featured on two previous albums, and were re-recorded with Roxy Music guitarist Phil Manzanera producing, to take advantage of the kind of improved sound quality a bigger recording budget can buy. The songs are progressive and are reminiscent of early Bowie and Genesis, but they also convey a sense of vaudvillian wit and whimsy that makes this album shine. Check out “Late Last Night”, “Sweet Dreams”, and the spoon solo on “The Woman Who Loves You” (yes, I said “spoon solo”). Thoughtful tunes. Great musicianship. Great arranging. Fantastic harmonies. These are the qualities that brings this album to the “List”. I try to imagine what it would have been like to have seen the band touring then. This would have been so much fun to see and hear in a pub or small venue. When I think about it, I find myself smiling and wanting a beer. 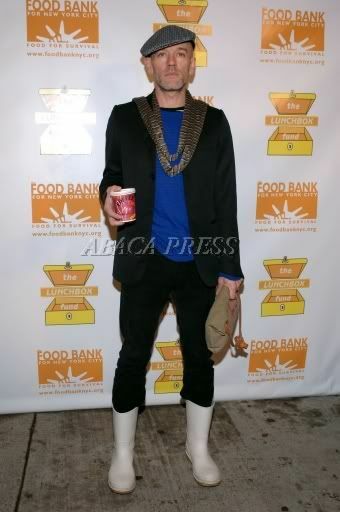 Look like Mr. Stipe needs to pay a visit to the “Queer Eye for the Straight Guy” guys. Or is that “Sorta Straight Guy”??? More of these at this web site! PS. Below is the original Helga Phugly from the TV show, “The Oblongs”. It only lasted a season, but it was Helga funny none the less. "It was a dark and stormy blah blah blah"
This is great fun at Karl Rove’s expense. Join in the story telling. This morning I find myself in San Diego. No, I wasn’t kidnapped or anything like that. I am hear to rehearse with Rare Form, my San Diego band. I stayed at my best friends condo last night. Well, it’ 9 in the morning, I’m awake and Paul isn’t. So, I decided to highjack his eMac and make a few modifications. I am adding my blog address and Chris Pays Guitar address to his bookmarks folder. I’ll add some horrible right-wing nut job site to his favorites. That should indear me. I should add something really naghty to his bookmar………. Oh, never mind. He beat me to it! Don’t know if the pay is good, but you may get to travel, AND, there is probably some mention of seventy-two virgins in the fringe benefits. Of coarse THAT is only provided after you blow yourself up. PS. Question? Why would you need the promise of seventy-two virgins when dying for a holy cause? You would think that dying for your faith and God would be a good enough motivation. Why would you need the extra virginish type perks thrown in? I am a sucker for these kinds of tests..